Have you ever hung a picture or attached a chair rail only to find out it wasn’t level? You may have even measured twice before hammering the first nail. It can be quite frustrating, plus you have to pull out the nails, patch, paint and hope for the best next time. Fortunately we don’t have to guess when attaching things to our walls. All you need is the best laser level. You may have noticed high-tech laser levels being used at construction sites. Fortunately the benefits of laser level technology are now easy to use and affordable for homeowners and weekend Do-It-Yourselfers. Laser levels save time and headaches by insuring you get it right the first time. Want to know more? Our guide for the Best Laser Levels for 2017 will explain everything you need to know! There are many kinds of construction laser levels but the best laser level for home projects is called a line laser leveler. The primary job of a laser level is to project a straight red laser line across your work area. The red line indicates where to cut, paint, nail or lay wallpaper. Instead of marking a straight line with a pencil, the red laser line indicates where “level” is or just marks out a straight line. This is great for knowing where to put nails when hanging a wide picture frame. Simply place the level on the wall at the height you want the picture to hang. The level will project a red line across the wall. But how do you know the line is really level? The laser level has “level indicators” built into the device. All you have to do is tilt the leveler until it indicates that level has been achieved. This insures the laser beam is really straight and level. Now you or a friend can mark the wall with a tiny pencil marks for the nails and hooks. Some of the best laser levels also measure length. Just point the device at a wall and it will display the length, like a tape measure. Some laser levels can also calculate square feet, which is great for measuring for carpet or tile. Real estate agents love this feature as it allows them to quickly determine the square footage of each room in the house. If you’re serious about having the best laser level tool, you’ll want a tripod-compatable laser lever. The tripod holds the laser level so you don’t have to. The laser will create a vertical or horizontal line or even both on the wall, floor or ceiling! There are a lot of laser level options to choose from. We reviewed the best laser levels for 2017 and outline all the features and benefits. This Black & Decker laser level is simple and easy to use. The laser level includes two bubble vials with backlights for setting the initial level. 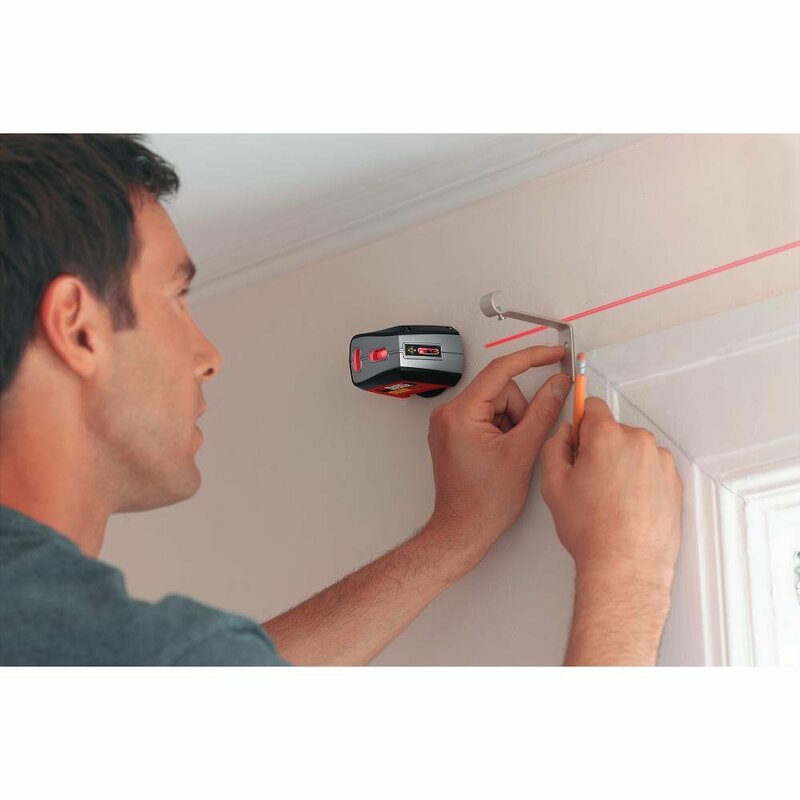 This laser level is perfect for hanging picture frames, mirrors and installing shades and curtains. This is a very popular laser level with homeowners. Uses two double-A batteries. 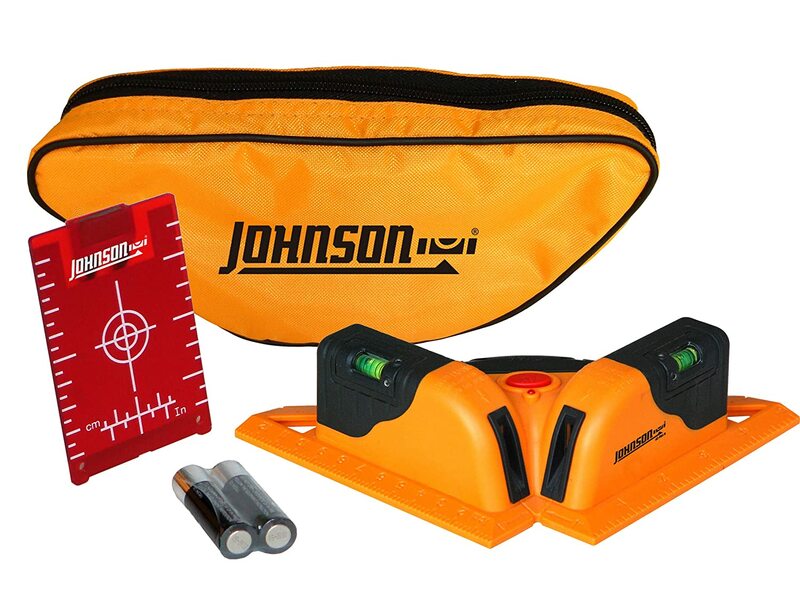 If you’re project involves any type of flooring, you’ll want this Johnson laser level. The Johnson Level generates two lines on the floor, at 90-degree angles. This level is specifically for surface layout of tiles, stone, brick, carpet and hardwood flooring. Having straight lines is essential for proper flooring installation. Comes with batteries and storage case. If you like the traditional look and feel of a 48-inch bubble level plus the benefits of a laser level, you’ll love the Empire Digital laser Level. 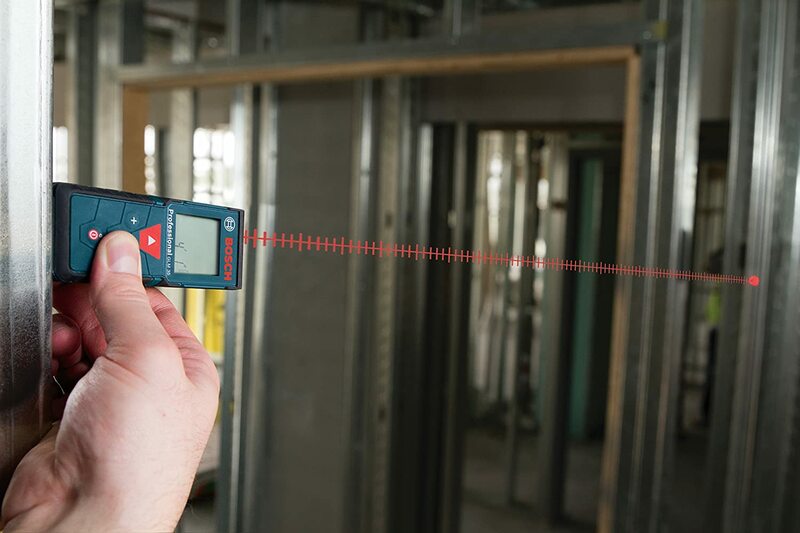 Many craftsmen rate this as one of the best laser levels for construction projects. The level gives an audible beep when you hold it level. Great for working overhead! The digital readout displays angle, rise, run and 5 slope. Comes with a handy carry case. Bosch is a well-known tool manufacturer by homeowners and professionals alike. The Bosch Laser Measure is feature packed, making it one of the best laser levels for the DIY home projects. Bosch laser technology gives precise accuracy to 1/16 inch. It also acts like a tape measure. As you slide the level the direct readout shows length on the LCD display. This small-sized laser level is lightweight and easy to hold. The backlit display can be read even in dim conditions. 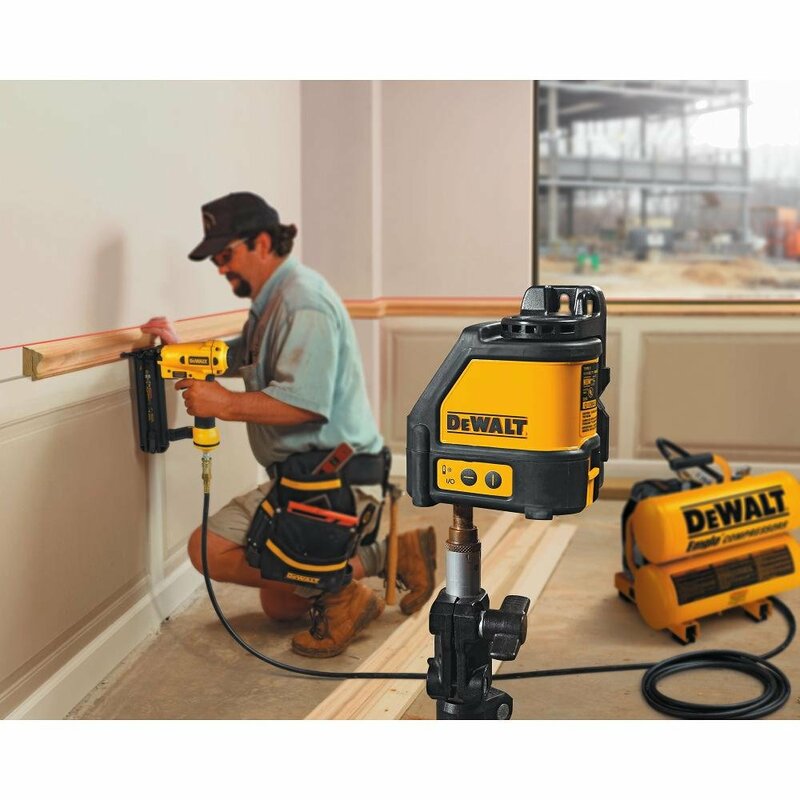 If you plan on remodeling a kitchen or laying out a large flooring project, you’ll need a rugged laser level like this Dewalt. This self-leveling laser projects bright red horizontal and vertical lines with accuracy within 1/8 of an inch at 30 feet. The Dewalt DW088K has an over-molded housing for water/debris resistance. Its built-in magnetic pivoting base and 1/4-inch thread make for easy mounting on metal surfaces or on a tripod. There are individual buttons on the side control panel that operate all three beams adjustments. The kit comes with a hard-sided storage box. If you are a serious remodeler the Dewalt Cross Line is the best laser level for heavy-duty jobs. So which is the best laser level for you? It depends on the complexity of your project. If all you need to do is hang a picture, a simple laser level will do the job. If you have several projects involving hanging large shelves or cabinets, a more advanced laser level is recommended. For small electric jobs, check out our best soldering irons.